You probably already know that tiny houses on wheels are typically less expensive than traditional home, but how much money can you expect to spend on a teensy dwelling? 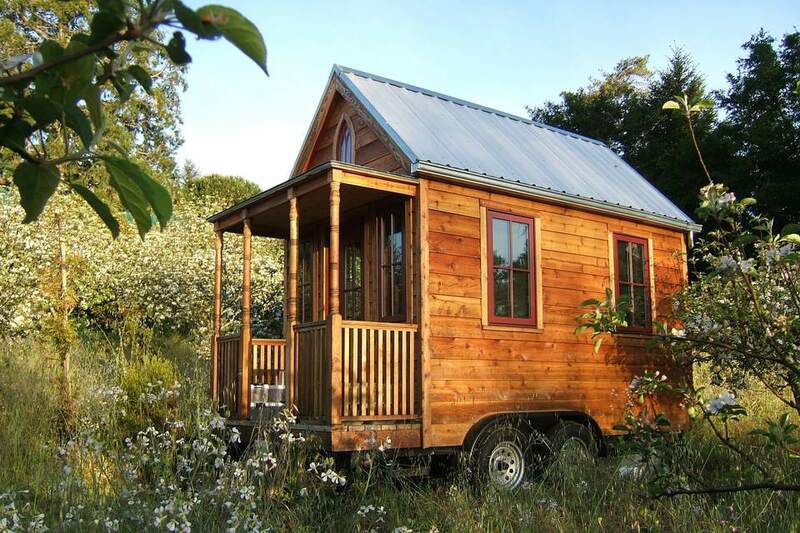 To help you come up with a realistic budget for your future dream home, we compiled the following list of pricing guidelines and surprise expenses for tiny houses on wheels. To get that number we compared prices for the year 2017 from 25 tiny home building companies located in 13 different states. Just so you know, unlike a traditional house, the price for a towable abode does not include land — More on that later. What can you buy for around $60,000? One example is The Shonsie, by 84 Lumber. The 206-square-foot cottage packs plenty of nice-to-haves like a kitchen stocked with Energy Star appliances and a loft bedroom with a comfortable full-size mattress. It takes a lot of skill, time and money to construct a move-in ready tiny house. That's why you won't find many professionally built options with all the usual comforts for year-round living like a toilet and shower, for less than $20,000. You will, however, find a modest selection for around $25,000. A good for instance is this 144 square foot cedar home by Little Digs Living priced to move at $25,500. When you picture your tiny dream home on wheels, is it tricked out with granite countertops, high-end appliances, and perhaps a posh hot tub? Then expect to pay $150,000 or more for a luxury dwelling that's less than 400 square feet. Sure, that’s a stack of cash, but for the record, the median cost for a brand-new traditional house for the year 2017 is more than $300,000, according to the U.S. Census Bureau. If you're looking to buy a high-end nest, behold The Alpha by New Frontier Tiny Homes. Its 246 square feet is brimming with top-notch appliances, transforming furniture and lavish fixtures. Our favorite feature is the full-size spa tub. To get an accurate estimate, we interviewed seven first-time builders with no prior construction experience. Their costs range from $12,000 to $35,000. Here's how two of those folks built their individual dwellings. Macy Miller transformed an old recreational vehicle that she bought for $500 into a 196 square foot home for roughly $12,000. That being said, it took her two years to pull the project together in its entirety, using mostly reclaimed materials. Full disclosure: Miller has a Master's Degree in Architecture. Taylor Painter Wolfe is a do-it-yourselfer who built her dream home after taking a tiny house workshop. Her colorful abode cost nearly $21,000 to build including the money spent on construction plans ($759) and the trailer chassis ($4,500). Can You Build a Tiny House for Less $10,000? Can you build a tiny house on wheels for less than $10,000? It's not impossible if you're using mostly free building materials such as reclaimed lumber. Another way you can trim costs is by attending a tiny house building workshop. Many first-time builders say a DIY class helped them avoid making costly blunders when constructing their homes. You can expect to pay up to $799 for a two-day workshop by Tumbleweed Tiny Houses. To be in the know, here's a rough breakdown of material costs for tiny houses built in 2016. Please note, tools and building plans aren't included. Let's say you want to DIY your tiny house but prefer to skip the heavy lifting that comes with starting at square one. Consider a tiny house shell. Most options like the one above by Tiny House Basics, have a finished exterior and an unfinished interior that leaves the customizing to the buyer. Depending on home size, ballpark estimates for towable shells range from $10,000 to $35,000. To make the do-it-yourself process a little easier, we suggest buying an option that has all the utility lines (water, electric and sewer) preinstalled. If you plan to hit the road, you'll need a truck that can pull the weight of your dwelling. You'll also need a trailer hitch and trailer brake controller. To protect your investment, you'll need tiny house insurance. Teensy dwellings built to meet requirements set for recreational vehicles can usually obtain RV insurance. Don't have a free place to park? Then your biggest out of pocket expense besides monthly fuel costs will be land. Some RV parks welcome tiny houses. Expect to pay $500 to $1,500 per month for a spot. Rent usually includes electricity and water hookups along with Wi-Fi and trash service. If RV parks aren't your thing, you can rent or buy a private lot through a real estate agent or tiny house message board. Keep in mind, when it comes to extras like electricity and water, you may need to generate your own power.